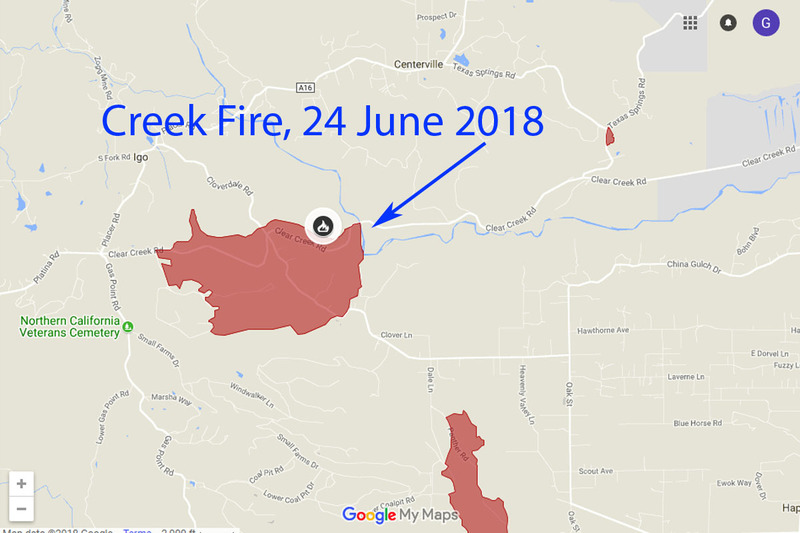 About a month ago, the small “Creek Fire” raged through a hilly spot west of Redding known as “Happy Valley.” Sadly, Happy Valley seems to be rather fire-prone, as there have been at least three fires there since I’ve been in the area, and evidence of plenty more well before that. The most recent fire was small enough to not really be newsworthy, at only 1,700 acres. While we saw the smoke, it didn’t really register on my mental radar until I drove up Clear Creek Road one afternoon to just escape into the country for a bit. But when I saw it, wow! The burned area surrounding Clear Creek Road looked like a moonscape, gray and desolate, with the burned trunks of a few trees punctuating the otherwise completely devastated area. Even the road was damaged, with melted guard rails and burned guardrail supports. Today I went out scouting and found that I can now drive quite a ways out Clear Creek Road before encountering a roadblock. So I made a video so you can see what a freshly burned area looks like. You can also see how much smoke we are still dealing with. And I’ll ask for some forgiveness in advance. The video is kind of long, almost 12 minutes. 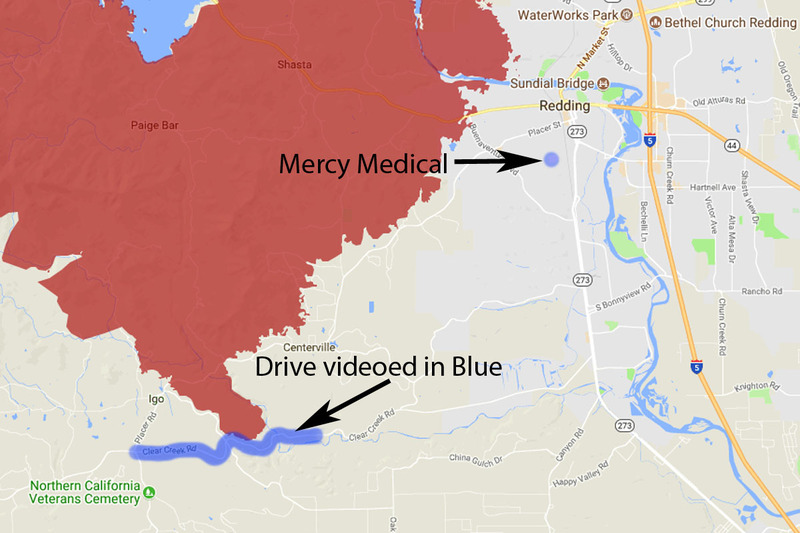 So if you want to see how smoky Redding itself is, and tire of listening to me chatter as I drive down a country road, then skip to the last couple minutes. Where The Videos Were Shot. By the way, in terms of update, there’s not a lot to report. It’s still smoky here, though perhaps a bit less so. Temperatures seem to have cooled somewhat, with highs now forecast in the lowest possible 100’s and nighttime temps dipping into the upper 60’s. And the fire continues to grow, but so does the containment percentage, now at 115,000 acres and 35%, respectively. 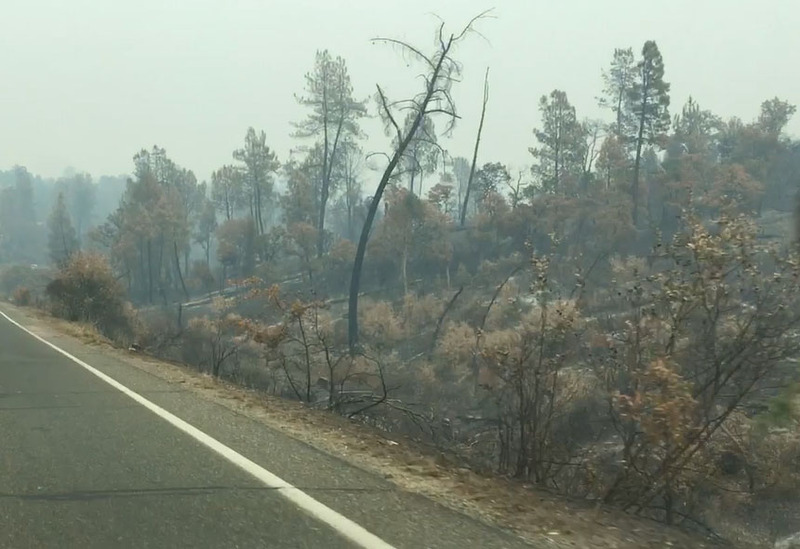 However the southeastern fire line at Placer Road continues to hold, so it would appear that Redding is safe for now. At least if the wind doesn’t pick up substantially. Keep your fingers crossed. Thanks for watching, and any criticism is much appreciated. Please leave your comments below. Did I miss a post? I thought you were still in Redding. No, you haven’t missed a post. I’ve not written in a long time, but am trying to summon the energy to write one. Currently I’m in Ajijic, and contemplating my first move. Thanks for the lovely words about the video and my comments elsewhere. Unfortunately, I can no longer comment on Al’s blog due to his requiring a Google account. In any case, future comments here should go through without moderation. Saludos and thanks for stopping by! I grew up around forest fires, but I never have become accustomed to them. The sight of smoke amongst trees still makes my stomach clinch. In this case,you really do have my empathy. Hola Steve, thanks for the kind words. Mom and I just went out to dinner, and on the way back, we were remarking that from inside the air conditioned car, we’d be able to imagine that we were driving through San Francisco on a foggy evening. But in this case, it’s smoke. Last weekend I drove to San Francisco, and discovered that the smoke is far worse 60 miles south of Redding than here. Basically you should tell your Mexican friends that if they come to California, “don’t breathe the air.” Saludos and thanks for stopping by. Interesting. Thanks, and hang in there, as they say. Saludos a Mom. Hola Felipe! Thanks for stopping by. We are hanging it. Smoke seems to be lifting. Slightly, anyway. Saludos! I am glad you are still safe but I’m sure it is really getting wearisome. Thanks so much for posting, I was wondering how things were going. Hola Nancy! It is getting wearisome. I haven’t been able to exercise for a week now. I don’t want to run while there’s still so much smoke in the air. And, as you might imagine, there’s not a ton of other things to do either. One of the big draws of this place is outdoor activities, which are now heavily restricted. Oh well. I do have other stuff to do. Saludos and thanks for stopping by!